ONE OF A KIND! Cannot be duplicated. 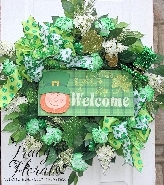 **Ships NEXT BUSINESS DAY** This deluxe, whimsical St. Patricks Day wreath features an adorable wood leprechaun 'Welcome' sign surrounded by green glitter tipped white carnations, lilacs, glittered green sprigs, shamrocks, ficus leaves and more. Finished with festive shamrock and green wired bows. Meausres 26" in diameter, and 7" in depth with some sprigs extending out a bit further.